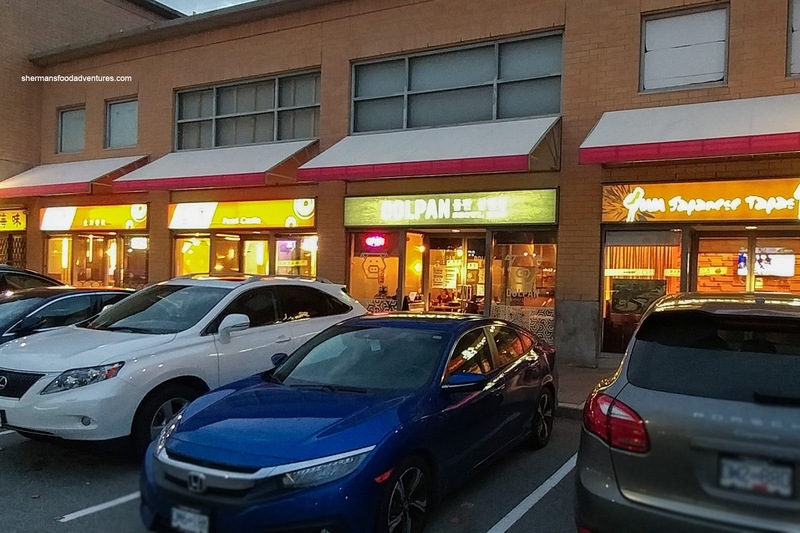 Korean BBQ has pretty much been mainstream for awhile now. Many associate this with the traditional cast iron pan that sits above a built-in gas or portable burner. 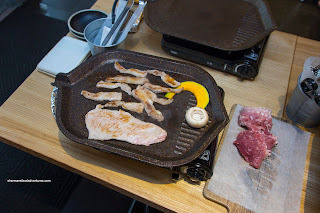 However, there are many other types of grills used for Korean BBQ, including non-stick pans, solid cast iron pan with oil drainage and the suddenly fashionable all-in-one with the side troughs for egg and cheese. 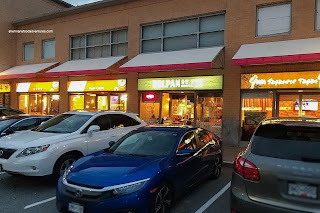 For this meal, we visited Dolpan in Richmond which employs the solid cast iron pan as well as featuring non-marinated meats. I met up with Nora, Joyce and Lesley to check it out. 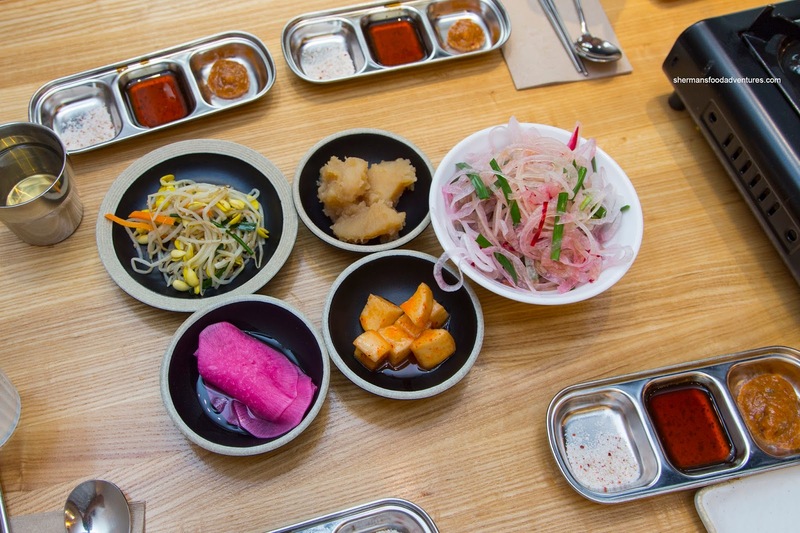 To start, the usual Banchan arrived consisting of pickled daikon, sprouts, stewed potatoes and spicy turnip. Pretty standard stuff and even though the potatoes looked mushy, they were actually quite good being nicely sweet and appealingly soft. For the BBQ, we decided to try the Pork Sampler with pork belly, mok sal, pork jowl and kaburisal for $39.00 at exactly 500 grams. They ended up cooking this for us as we already had a full table and an upcoming hot pot as well. The meats arrived well-seared and fully cooked (maybe a tad over done). We dipped the meats into the 3 condiments provided which included fermented bean paste, sweet bbq sauce and salt. I thought the pork belly was the best as it was meaty with only a modest amount of fat. Onto the most visually-striking dish, the Army Base Hot Pot was a mish-mash of everything one could find lying around. 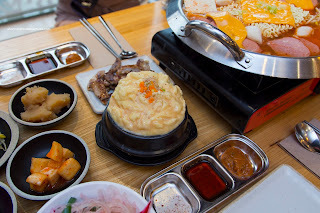 This included wiener, sausage, spam, tofu, instant ramen, rice cake, cabbage and processed cheese. Although the ingredients were modest (everything found on a army base...), it all went together nicely including the cheese. 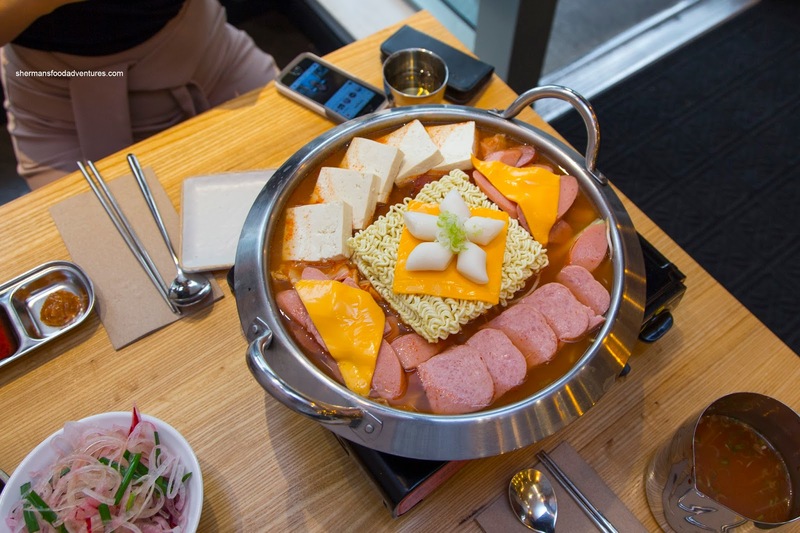 The salty, spicy and comforting quality of the hot pot really came through. On the side, we added the equally-striking Egg Volcano. Although it looked perfectly cooked on the outside, the inside was actually well-done. So any fluffiness was reserved for the outside. In the end, we thought the meal was pretty good. I liked the quality of the BBQ meats, but the prices in general are on the higher side.